Bha Wolfgang Amadeus Mozart (27 am Faoilleach 1756 – 5 an Dùbhlachd 1791) ’na cho-ghleusaiche sa linn chlasaigeach, às an Ostair. Sgrìobh e barrachd air 600 pìosan obrach agus tha fèill mhòr air an obair aige fhathast. Bha e pòsta agus mhair dithis mhac dha beò. Chaochail e nuair a bha e 35 bliadhna a dh'aois agus tha miotas air a bhàs an-diugh. Tha an ceòl aig Mozart gu math ainmeil agus buadhmhor. Rugadh Mozart ann an Getreidegasse 9, Salzburg, san Ostair a rèir ainm na dùthcha sa là an-diugh. B' e Leopold agus Anna Maria Perti Mozart a phàrantan. Bha piuthar na bu shine aige, Maria Anna (1751-1829), Nannerl a far-ainm. Bhaisteadh Mozart ann an Cathair-eaglais an Naoimh Rupert an là as dèidh a bhreith. B’ e Johannes Chrysostomus Wolfgangus Theophilus Mozart an t-ainm slàn a bh' air. Bha athair à Augsburg. B' e Kapellmeister (maighstir-ciùil) ann an orcastra-cùirt a bh' ann airson Àrd-easbaig Salzburg. B' e co-ghleusaiche agus tidsear a bh' annsan cuideachd. Gu tric, chuir e seachad mòran ùine air a' chlabhier, a' cluich treasan [...] agus ghabh e tlachd às an fhuaim [...] Anns a' cheathramh bliadhna aige thòisich a athair, mar gheama, a theagaisg beagan minuet agus pìosan eile dha air a' chlabhier [...] B' urrainn dha an cluich gun mhearachd agus le maothalachd mhòr, agus tìm a chumail gu math. [...] Aig 5 bliadhna a dh'aois bha e a' sgrìobhadh phìosan beaga mu thràth agus sgrìobh a athair sìos iad. Tha na pìosan sin ann an Nannerl Notenbuch (leabhar-nòta aig Nannerl). Nuair a dh’aithnich a athair comas a mhic, sguir e fhèin air ceòl a sgrìobhadh. B’ e Leopold an aon tidsear a bh’ aig Mozart. Theagaisg e ceòl, cànain, agus cuspairean sgoilearach eile dhan chloinn. ↑ “Mozart's Birthplace”. Mozarteum Salzburg. Air a thogail 27mh dhen Fhaoilleach 2019. ↑ “Nannerl's Music Book (Mozart, Leopold)”. IMSLP/Petrucci Music library. Air a thogail 26mh dhen Fhaoilleach 2019. 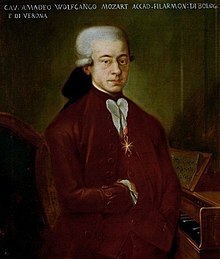 Air a tharraing à "https://gd.wikipedia.org/w/index.php?title=Wolfgang_Amadeus_Mozart&oldid=545270"
Chaidh an duilleag seo a dheasachadh 27 dhen Fhaoilleach 2019 aig 12:43 turas mu dheireadh.